A number of reviewers loved how striking the Puma Future 18.3 FG/AG football boots are especially with their Blue Lagoon/ White/ Green Gecko colorway. The grip provided by the pair have been highly praised by a handful of wearers. 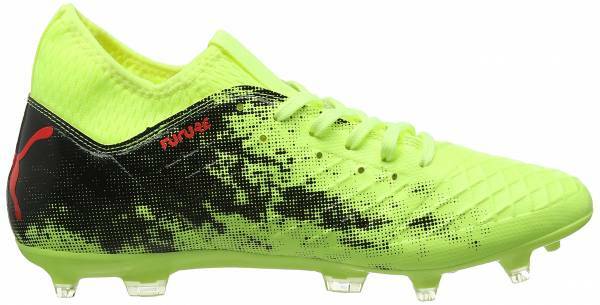 Several footballers revealed that this Puma Future model is lightweight. A significant number of users said that the Puma Future 18.3 FG/AG is of good quality. The Puma football shoe belongs to a budget-friendly price range. One user explained how he liked the Spandex sock’s ability to protect the ankle area but also how it adds comfort. One reviewer shared that his pair brings a slight discomfort in the heel area as a plastic shell presses through the padding. Several players revealed that the Puma Future 18.3 FG/AG football boot has a narrow fit which can be quite an inconvenience for the broad footed footballers. Another user had a concern with the lacing system as she explained that they are too short considering the shoe’s wide opening. This budget-friendly model doesn’t just deliver a striking look on the pitch; the Puma Future 18.3 FG/AG football boot is also a shoe of comfort and versatility. The pair also provides grip on both firm ground and artificial grass courts. Additionally, the shoe has a comfortable, lightweight composition. However, the pair has a narrow fit which can be an inconvenience for the broad-footed player. Overall, this narrow-fitting model is for the player looking for versatility and comfort on the court without being short on the looks department. Bringing versatility into football pitches is the Puma Future 18.3 FG/AG football boot. As the name suggests, it is designed to provide traction on both firm ground and artificial grass courts. The soleplate is created out of a Thermoplastic polyurethane outsole which is known for its lightweight composition. The stud configuration used consists of conical and bladed studs which are engineered to provide grip, flexibility as well as maneuverability. There are a total of thirteen studs incorporated into the outsole. In addition, the upper of this model is created with a synthetic material which is engineered for softness and comfort. Reinforcing comfort and fit is a Spandex ankle sock which also acts as a support for the player’s foot. A net-like texture is also incorporated similar to the high-tier model that features Puma’s Netfit material. The true Netfit element is also found in the popular Puma Future 18.1 Netfit FG/AG model. The colorway yellow/ red/ black colorway makes the pair highly visible on the pitch. The Puma logo is placed in the heel area colored in red. The effect creates a contrast with the shoe’s black areas. The Puma Future 18.3 FG/ AG brings softness through its synthetic upper. It is available in men’s standard sizes ranging from sizes 7 to 13. The foot sports a central lacing system which promotes fit customizability. TPU has been used in the construction of the FG/AG version of the Puma Future 18.3. The material is a recurrent feature among football boots soleplates as it boasts a lightweight composition and durability. The stud configuration is one that is composed of conical and bladed studs. A total of thirteen is placed in the plate with nine at the forefoot and four placed in the heel area. Promoting softness through its upper, the Puma Future 18.3 FG/AG football boot uses a synthetic material. Doubling the comfort as well as support is the shoe’s Spandex ankle sock. A central lacing system is made available to further customize the football boot’s fit. A similar feature can also be found in the Puma One 18.1 K-leather FG shoe. The shoe is predominantly colored yellow with splashes of black and red. The lateral side of the shoe features a net-like texturing which mimics the look of the Netfit material used in the Puma 18.1 model. While the material brings the look of Netfit, it is purely for aesthetic purposes. The lateral side of the shoe has been colored red. The Puma Future 18.3 FG/AG football boot is available in several colorways including yellow/ red/ black, black/ green and deep lagoon/ white/ green gecko.